Go Ahead, Split the Party! Portals are magical gates between rooms. With the 24 Portal links and 10 new cards in this set, you can move to the other side of the dungeon in the blink of an eye – or stay where you are and throw potions across the board! 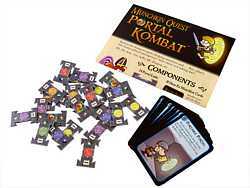 You can play this with just the original Munchkin Quest game or add in Munchkin Quest 2 – Looking for Trouble for extra mayhem!